H. Rick Bamman - hbamman@shawmedia.com Golfer Lang Choi of Schuamburg, practices putting before a round of golf with friends at the Golf Club of Illinois in Algonquin on Tuesday, March 29, 2016. Spring-like weather continues with a chance of showers on Wednesday afternoon with highs in the upper 50's. 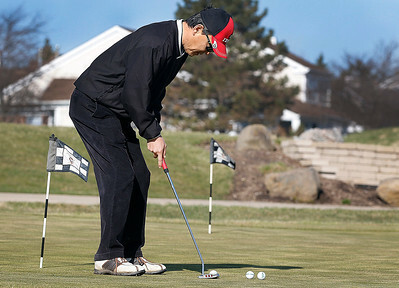 Golfer Lang Choi of Schuamburg, practices putting before a round of golf with friends at the Golf Club of Illinois in Algonquin on Tuesday, March 29, 2016. Spring-like weather continues with a chance of showers on Wednesday afternoon with highs in the upper 50's.